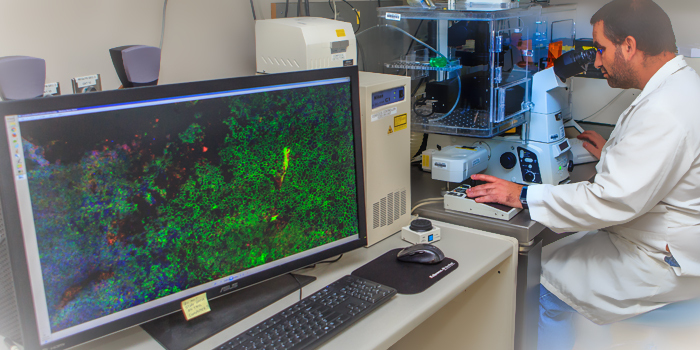 Micah Chrenek, BS, Lab Manager at the confocal microscope in the Functional Genomics and Proteomics (FGP) Core lab. The Atlanta Vision Research Community (AVRC) provides support and scientific expertise for individual, collaborative, and pilot research in the areas of Structural Biology and Imaging, Functional Genomics and Proteomics, and Bioinformatics and Biostatistics, as they relate to basic and translational eye research. 6. Encouraging non-vision scientists to study vision by offering Core support. The resource/service cores enhance collaboration, support pilot projects leading to new R01 proposals, and complement the annual support for research by Emory Eye Center, the Emory School of Medicine Department of Ophthalmology and other departments within Emory University, the Atlanta VA Medical Center, Georgia Institute of Technology, Georgia State University, and Morehouse School of Medicine. This core supports a robust and highly competitive program of training and core scientific resource support for pre- and postdoctoral fellows supported through an NEI Training Grant, K-, and F-series awards.